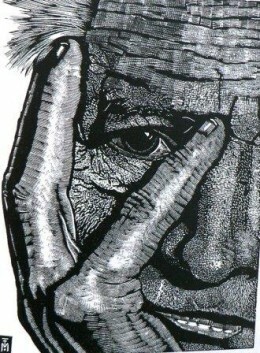 Wood engraving can be a fine medium for capturing the dignity of the human face. The grain of the wood can be utilised to emphasise the age of the sitter – and the contrast between light and dark, in both the background and facial features of the subject, can be highlighted by the engraving process. Let me share some of my favourite ‘faces on wood’ with you. I hope this may encourage you to seek out wood engraved books and prints, and see the human face anew. The face you see in this introduction is of the late Iris Murdoch by the US engraver, Abigail Rorer. (Images: all photographs taken by me from books and prints in my collection). Wood engraving involves carving finely into the end grain of a wood block to create a raised two-dimensional surface with the desired image in relief. The raised wood surface, when coated with ink and pressed into paper or other material, appears as a black image. The wood below the raised section, because it does not make contact with the surface of the paper, shows as white. This is the basic idea, but, of course, the skill of the engraver is to manipulate the surface of the wood to highlight and emphasise the small features – the ‘devil is in the detail’, as the saying goes. The engraver can make a drawings first, and then either trace this onto the wood before cutting into the surface. Alternatively the artist can work in a free-style way, often finding a direction and design once started. You can find out more about the process by visiting my article ‘The Art and Craft of Wood Engraving’. 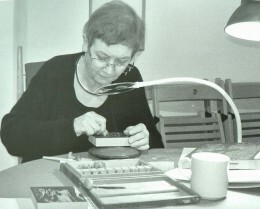 The wood engraver shown in this photograph is Hilary Paynter. 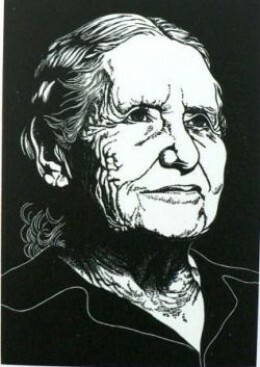 One of her portraits on wood is shown immediately below. 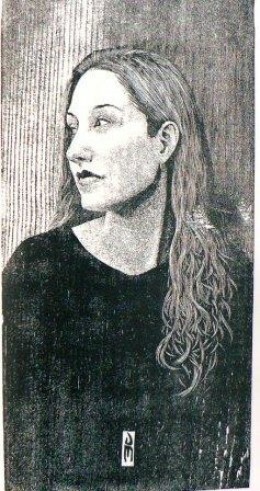 The distinguished British engraver, Hilary Paynter has produced this work: Kelly (1981). It is a portrait of her friend’s daughter and captures the detached world of the child. The angle of the girl’s head and line of gaze draws our attention to her hands, as she plays abstractedly with the wild flowers. The image is taken from Hilary Paynter’s book: Full Circle: Hilary Paynter, Wood Engravings (2010) published by Woodend Publishing. This portrait of the US Catholic nun, teacher and scholar, Thea Bowman, is by British wood engraver, Simon Brett, and is taken from his book, An Engraver’s Progress. 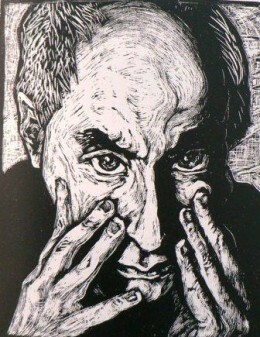 Simon Brett: Fifty Years of Wood Engraving. Simon Brett uses the grain of the wood to highlight the facial and arm features of Thea. He captures too, the spirit and movement of the woman; note too, the fine detail of the head scarf and dress. 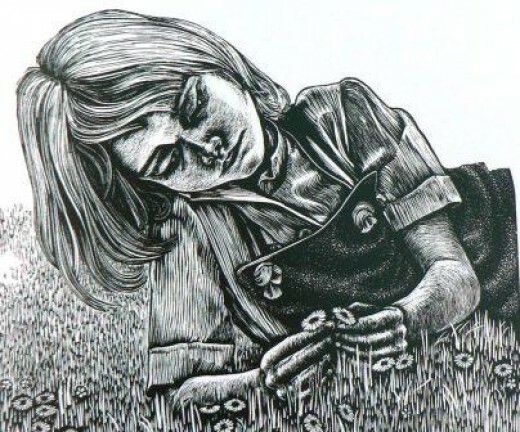 The engraver, Rosemary Covey was born in South Africa in 1954 and immigrated to the USA in 1962. Her work often deals with themes of loss, illness and death. In her portrait, Jerry Max (1995) we get a sense of the fear that can lie behind life. The furrows in the man’s forehead, and upward pointing fingers lead our eyes to his. The man’s anxiety is manifest. 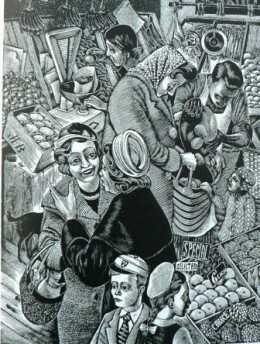 The British wood engraver, Jim Bostock (1917-2006) catches the bustle of a mid 20th century street market in England. There is much animation and detail in the scene, but our eye is drawn to the two women enjoying a lively conversation. The listener looks as if she is very interested in the topic; she listens with rapt attention to the other. Her expression is pleasant, open and engaged. Note the period detail, in particular the dress of the listener. Her clothes are smart; she wears a necklace for her shopping trip. This was very typical of working class communities in the 1950s. The two children in the foreground are in school uniform; the boy wears a school cap – a rare sight today. The US wood engraver, illustrator and designer, Beth Krommes catches the love of a woman breast-feeding her baby in her print ‘Nursing’. Beth sells her prints in fine craft galleries in New England, and elsewhere in the USA. The mother fixes her gaze on the child; the sweep of her hair draws our eyes towards hers. The roundness of her bosom is emphasised by the swirls, curves and circles of the patterns and decorations on her dress and elsewhere in the print. French born (in 1938) engraver, Francois Marechal, has lived and work in Madrid since 1963. His wood engravings show great attention to detail, as we see in this close-up section of a male face in his print, Actor, made in 1963. The fingers frame the sitter’s eye, pulling our gaze to it; note how Francois uses the grain of the wood to pick out the tufts of hair, wrinkles, lines and blemishes of the skin. The US engraver, James Mundie, often uses the broad and coarser lines of plank, rather than the finer wood end-grain. This is shown to good effect here, particularly in the background, where the tonal lines of the wood and engravings pull our eyes down to the clean, clear skin of the woman. James catches the beauty of his subject; the lightness and clarity of her face is highlighted by the darkness of her dress. Note too, the fine detail of her hair, and how the fall of the hair pulls our eyes down to the decoration on her belt. The German-born engraver, Peter Pfefferkorn, enjoys working to a large scale in wood, and is drawn to historical and current affairs related subjects. His work, shown here, The Nay-sayer, (1984) catches all the pessimism and pinched-caution of someone who enjoys saying ‘no’ to everything – particularly pleasure, or showing tolerance or generosity to others. 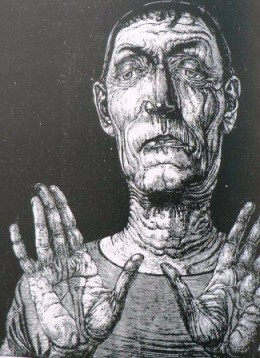 The negativity is etched into the face, neck and hands of the ‘Nay-sayer’, and emphasised by the downward cast of the eyes, the pursed lips and ‘stop’ position of the hands. 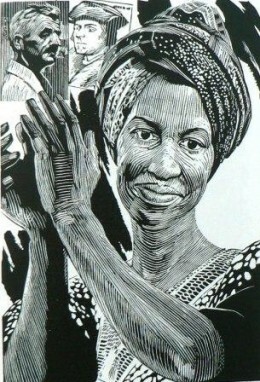 The US engraver, Marsha Sweet (born 1936) has often depicted women – film stars, singers, writers, artists – in her work. 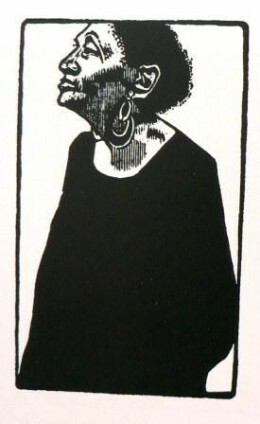 Her subject in this print is the US Blues singer, Alberta Hunter. Marsha captures the dignity of Alberta in this subtle work. Alberta’s body is slumped, but this is contrasted by the upward tilt of her head. Alberta Hunter had a disadvantaged background and a difficult emotional life, but rose above it all with her singing. She enjoyed a successful career and died in 1984. Marsha Sweet catches both the difficulties of Alberta’s life in the body shape – and the pride of success, against the odds, in her face. 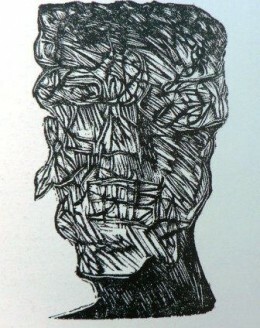 Brazilian-born engraver, Marcos Varela, has produced a series of abstract portraits in his work, Five Engravings, produced between 1997-98. Here the grain of the wood is used for maximum effect to suggest an almost Cubist-like abstract head of a man. His work has been exhibited in Brazil and elsewhere in South America and, in recent years, across Europe, where it has been well-received. 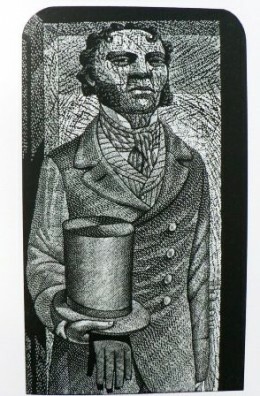 British engraver, Harry Brockway, catches the spirit of Dostoyevsky’s novel, Crime and Punishment in his book illustrations for the London-based Primrose Academy edition of the novel, published in 1999. Here the character of ‘Petr Petrovich Luzhin’ is depicted thus by Dostoyevsky : “This was a gentleman no longer young …prim, portly, with a face that expressed caution and peevishness. Brockway emphasises these deadening qualities in the man described by narrowing of the eyes, downward turn of the lips – and by framing the portrait within a coffin-like border. Note too, how the slash-marks in the background and grain of the wood emphasise the character of the man. Do you like books illustrated with wood engravings?